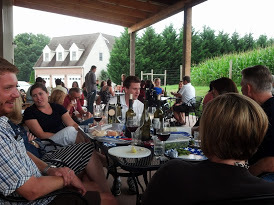 The wines’ bouquet and brilliance are distinctive due to the cool breezes from the Patuxent and Chesapeake rivers and the unique sandy terroir. Heritage region’s crispy white wines, like Viognier, and Sauvignon Blanc, are favorites. Also, try the Heritage region’s award winning full bodied reds, Malbec and Shiraz varietals. Romano Vineyard, Great Frogs, Thanksgiving Farms, Fridays Creek, Perigeaux Vineyard and Winery and Running Hare Vineyard are some of the wineries you may visit. Heritage region’s crispy white wines, like Viognier, and Sauvignon Blanc, are favorites. Also, try the Heritage region’s award winning full bodied reds, Malbec and Shiraz varieties. Thanksgiving Farm and Running Hare Vineyard are the vineyards you will visit.